Since the Second World War, Rosie the Riveter has been immortalized as a symbol of the strength and power inside every woman; and it is that force that drives and inspires the fiercely talented members of Rosie and the Riveters. These ladies’ compelling performances combine seductive vocal arrangements with body percussion, acoustic instrumentation with scintillating dance moves, and inviting humor with a lot of charm! Attend their 2 p.m. matinee at Horizon Stage on Thursday, February 4 and you’ll be treated to traditional African American spirituals, beautiful bluegrass numbers, contemporary folk songs, lovely a cappella, and original material. This ain’t your wailin’ and weapin’ gospel hour! 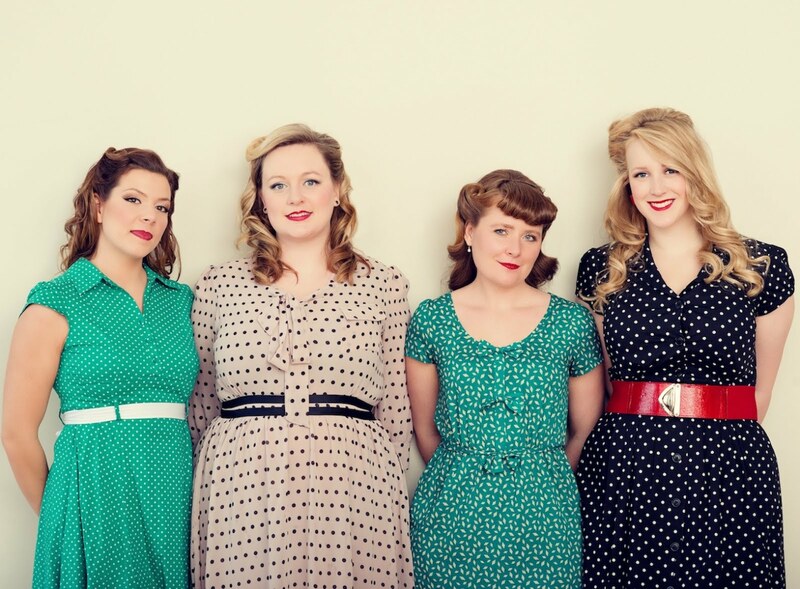 Rosie and the Riveters revisit the spirit of folk infused with the magic of the 1940s. Alexis Normand, Allyson Reigh, Melissa Nygren, and Farideh Olsen are the four classy dames from Saskatoon, Saskatchewan who make up Rosie and the Riveters. All professional musicians with impressive credentials and projects outside the band, it’s the uplifting, vintage-inspired music that they sing together that will charm your socks off. With whoops, hollers, and mile-wide smiles, they create a feel-good concert experience that’s lighthearted and captivating for all music lovers. Rosie and the Riveters’ debut album, Good Clean Fun!, is high-energy and versatile. It combines The Andrews Sisters vintage vocal treatment with Mahalia Jackson soul and the sweetness of the Good Lovelies. Sealed with Rosie and the Riveters’ signature vocal harmonies and humour, it features songs about everything from their deep love of thrift store shopping (“Red Dress”) to post-apocalyptic visions of the melting of the ice caps (“Watching the Water Rise”) to dancing angels (“Dancing ‘cause of my Joy”). It is the perfect example of the group’s overarching values of love, harmony, and gratitude, with a little sass and a touch of ooh-la-la tossed into the mix. Spend the afternoon with Rosie and the Riveters at Horizon Stage on Thursday, February 4. Doors open at 1:45 and the concert starts at 2 p.m. Tickets are $25 for all ages, and may be purchased at the City Hall Ticket Centre (315 Jespersen Ave), by phone at 780-962-8995 or 1-888-655-9090, and online at Ticketpro.ca.